Last weekend I went to my first ever Comic-Con event right here in Brisbane, and I’m hooked! 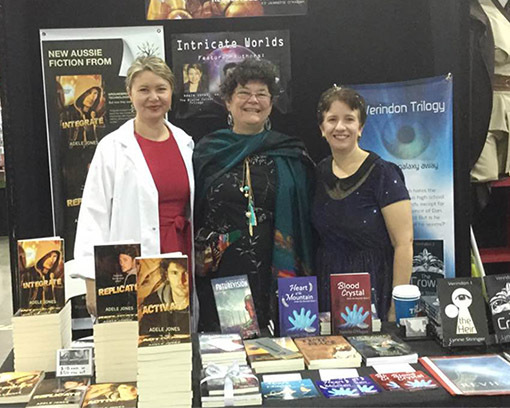 I was at the Intricate Worlds table with two author friends, Adele Jones and Jeanette O’Hagan. It was a great idea to share a table, as it meant we could not only share the costs but also man the table if one or other of us wanted to take a break and see all the great things on offer at Comic-Con. I’m happy to say that all three of us were pleased with the response our books received. We gave out so many bookmarks that Adele ran out and Jeanette had few left as well. And we sold a good number of copies, too. But aside from the commercial aspect, it was fun attending and seeing the work some people put in to their costumes. Some had been made solely by the cosplayer and were often intricate and well-constructed. It was fun learning all the fandoms everyone belonged to and seeing people enjoying them, just as I enjoy my own. It was also great seeing a full-sized x-wing and some daleks! Sounds like you all had a great time, Lynne. I was sorry to miss it, but will hopefully make it next year. Is your new manuscript sci-fi/fantasy? Hi Lynne. It was a fantastic weekenfpd for all the reasons you mentioned. Thanks for sharing it. Congrats ladies on your achievements. It sounds like so much fun. Wish I could have been there. Ooh, funnily enough I’ve never thought of a comic con as a way to share books… great idea! excellent idea to go as a group. Could recommend each other’s books and support each other. I’ve always been curious about Comic-Con, but haven’t had the courage to make the plunge. Now I want to go! Glad you had fun and that you were all successful in getting your stories out there! Love it!